AUTHORS: Cracknell, Tamsin; Tarnow, Dennis P.; Howes, Dale; Chu, Stephen J.
Implant restoration in the anterior maxilla is restricted by the necessary tilting of the implant relative to the occlusal plane, to maximize use of available bone volume. This angular discrepancy often prevents screw-retention, which can inhibit retrieval, maintenance, and increase risk of biologic complications associated with cement-retained crowns. This retrospective CT study aimed to quantify the range of angulations between planned implant axis and ideal prosthetic screw axis in central maxillary incisors. Routine CT scans were analysed retrospectively using implant planning software. Implant positions were planned so as to make maximum use of available bone, while leaving a facial gap width of 2mm. Screw channels were planned to emerge through the cingulum, 1mm from the incisal edge. The angulation between the planned implant and screw channel axes was measured. CT scans of 15 patients (7 female, 8 male) requiring implant restoration of a single central (n=13) or lateral (n=2) maxillary incisor were analysed. Mean age of participants was 41 years (range 18 – 74). 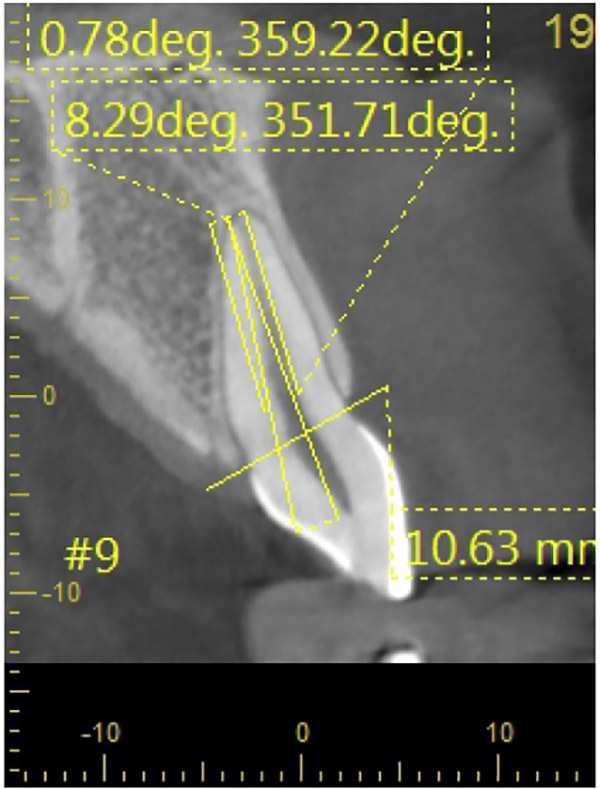 The mean angle between planned implant and screw channel over all teeth was 9.83° (SD 0.74) with a range of 9.03° – 12.09°. There was no significant difference between mean angulation for central (9.84°, SD 0.76) and lateral (9.79°, SD 0.88) incisor angulations. Similarly, mean angulations for males (9.86°, SD 0.38) and females (9.80°, SD 1.05) did not differ significantly. Angular discrepancy between planned implant and screw channel axes was between 9 and 12°, regardless of tooth site and gender. This information is valuable for clinicians and dental technicians when planning restorations, to ensure optimal crown emergence profile, and facilitate screw-retention. Figure 1: CT scan showing planned implant axis (leaving 2mm facial gap width) and ideal screw channel axis, 1mm palatal to incisal edge. Angulation was measured using implant planning software.